Hall of Fire chat tomorrow. Nazgul: masters or slaves? Middle-earth abounds in characters both creepy and gruesome; Gollum, Shelob, trolls and orcs. 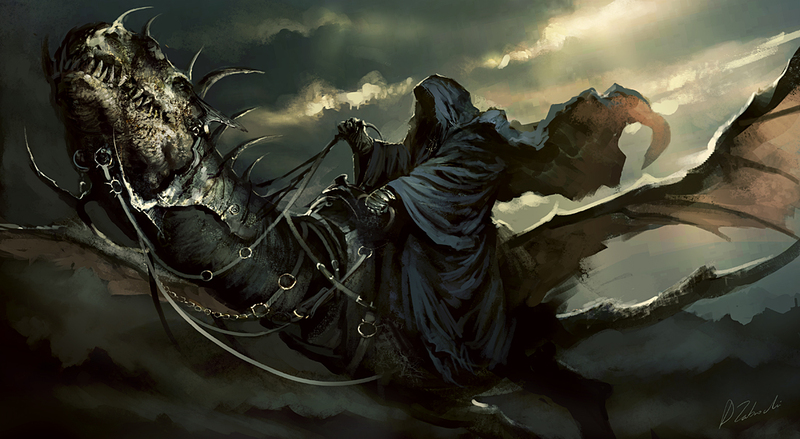 Arguably, none inspire the shivers quite like a Nazgûl. Nine Rings he gave to Mortal Men, proud and great, and so ensnared them. Long ago they fell under the dominion of the One, and they became Ringwraiths, shadows under his great Shadow, his most terrible servants. The Nazgûl occupy a fascinating position in the hierarchy of Sauron. As his chief captains, they sit at the top of the pile (MoS excepted perhaps) — feared by every underling, and by the enemies of the Dark Lord. Yet as Gandalf points out, the power of the One Ring has made them utterly bereft of any power to resist Sauron’s commands. If, as Gandalf says, we should “pity even his slaves”, should we not pity the Ringwraiths most of all? What is the story of the Nazgûl? How do their origins affect how we ought to perceive them? What is their responsibility? Are they truly masters? Are they slaves? Or some strange combination of the two? Join us tomorrow (May 11) at 6.00pm ET (New York time), when we’ll discuss all this and much more!